Nels the Naughty likes to drink. He stands in the same spot all the time, and is an easy target when no other guests are present. He likes Dovesi because she reminds him of his late daughter. He doesn't dislike Primo, but Nels will begin to suspect him earlier on in the quest. 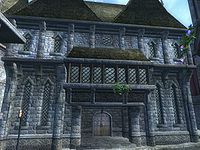 He dislikes Neville because the Imperial Legion refused to help him and his fellow villagers when they were attacked by bandits in Solstheim, leading to the death of his daughter Olga. If he and Neville are the last two alive, Nels will likely pick up any nearby weapon and attempt to kill him. Also, if you have raised his disposition high enough, he will attack Matilde if he and she are the last two guests left. If he's the last one alive, he will head for the basement. If Nels and Dovesi are the last two alive, and you have a high disposition with Nels, he will choose to believe that the attacker must be coming in through the window rather than believe that you or Dovesi could be the killers. Dovesi has no such inhibitions about killing Nels however... Nels can also be convinced to kill Primo if they are the last two alive. Nels is the only guest who, even with maxed disposition, will still recognize you as the murderer if you killed all the other guests yourself. He also appears to be unique in that he fits Primo's description of him, that behind the drunkard he is hard and calculating. He is the only guest who realizes, relatively early, that there is an assassin sent to kill them and not a greedy guest. This page was last modified on 10 February 2017, at 22:48.